Mailboxes and mail service are provided to resident students of Lindenwood University. 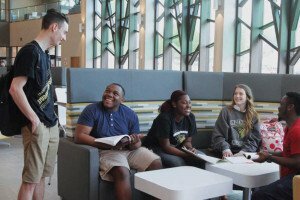 Lindenwood University offers incoming mail services to current resident students. Students who require a more complete offering are encouraged to contact the United States Post Office in St. Charles or one of the local mail handlers for a mailbox which can be rented for a minimal charge. Lindenwood has no affiliation with any mail carrier. The university is not responsible for lost mail or packages. Please note the same day package pick-up times below. FedEx, UPS, and the United States Postal Service do not deliver to the dormitories or houses, only to the university mailroom. We are not able to collect deliveries any earlier than 8 a.m. or at any time on Sundays. Please do not ask for any early morning delivery options or Sunday delivery. We provide mailboxes, package pickup, and package tracking services to students. Students who receive packages or trackable mail will be notified via e-mail to their student email account with pickup instructions. You must show your own Lindenwood ID in order to obtain any accountable mail. Due to the high amount of incoming packages same day pick-up begins at 2:00 P.M. Monday-Friday. Same day pick-up begins at 12:00 P.M. on Saturdays. If you can't pick up your package during our operating hours, you may notify us via e-mail at MailServices@lindenwood.edu that someone else will be picking up your package. To do so, send a message to MailServices@lindenwood.edu with the header Alternate Pickup, and include your name and theirs. In order to check the package out to them, we must have received this message and seen their Lindenwood ID. Do not reply to the automatic receipt e-mail. That is a no-reply address. Our package tracking services are generally used when things go wrong, and we understand that these situations can be very stressful. In most cases, the package is on campus and can be picked up the same day as the inquiry. Please contact us via e-mail at MailServices@lindenwood.edu with the tracking information and your preferred method of contact, and we'll run our search and contact you as soon as possible. This mail will be placed into the student’s mailbox. Letters are sorted by name into the correct boxes, so if you've had another box previously, any letters you receive will be forwarded to your current mailbox. Please empty your mailbox frequently. If your mailbox fills to the point that the box cannot hold it, any mail over two weeks old will be returned as undeliverable. Students who receive this class of mail should check their mailbox on a daily basis. The mailboxes are small and can only hold a small amount of mail; overflow mail is stored with oversize mail, and returned to sender after two weeks as undeliverable mail. Anything we receive with a tracking label will be entered into our package tracking system, which automatically generates your notification e-mail. Oversized letters, overstuffed letters, and certified letters are included. Please follow the instructions in the e-mail to collect your package. All packages over two weeks old will be returned to sender. Students living on campus are issued a mailbox only if they request one. Mailboxes are a privilege. You may receive on-campus mail including grades and news from offices that need to contact you, so check your box frequently. See Student Responsibilities for more. You are expected to know your mailbox combination and to be able to operate the mailbox. We will provide assistance as needed, but are not available to check and open each student’s mailbox. If you have an inoperative or broken mailbox, inform the mailroom staff to have it repaired. At the end of the school year, any mail remaining will be returned to sender. We do not hold mail over the summer. It is the student’s responsibility to ensure their mail is being sent to the correct address. We do not forward mail. Students remaining on-campus over the summer must notify the mailroom to avoid loss of mail privileges. When flowers are delivered to the mailroom, we contact the phone number on the order slip to arrange pickup. We do not deliver flowers. Not all flowers are delivered to the mailroom, and can end up in unexpected places across campus. Do not open mail that is not addressed to you. Promptly return it to the mailroom. Check your mailbox on a regular basis. Ensure your correspondents have and use your correct mailing address, including the name(s) you used to register your mailbox. Ensure the mailroom has your correct name (and any names you may receive mail under).